The first thing to do when trying to assess the Canadian system is to put to one side all comparisons with the U.S. system, because the systems are based on fundamentally different premises, and because that comparison has been used by the unreconstructed defenders of the system as a way of scaring Canadians. “Down there, they check your wallet before your pulse,” as Jean Chrétien would say. There is a good reason why no country in the world uses the U.S. as a marker. The U.S. system takes up almost 18% of its gross national product (GNP), compared with a little less than 12% for us. Why would we adopt the U.S. system, which costs 50% more of GNP and does not produce 50% better healthcare outcomes? And to my knowledge, no political actor in Canada of any prominence wants to adopt the U.S. system. And yet over and over again, in listening to the discussion, you hear people say that doing x or y would lead us down the slippery slope to U.S.-style medicine. So let us exclude that boogeyman. Just leave it aside. The second thing to do when looking at our health system is to benchmark: compare it to other systems in order to determine where we are and how we might get better. In doing so, we need to acknowledge that every benchmark has its limitations because people ask different questions and are interested in different points of analysis. Putting all the emphasis on one comparison can be misleading. But if you look at a fairly large number of benchmarks asking different kinds of questions, using different methodologies and more or less all pointing in the same direction, you can get a general sense of where Canada stands. Where does Canada’s health system stand? So without putting a huge amount of emphasis on any particular one, here is where Canada stands on a number of international benchmarks. 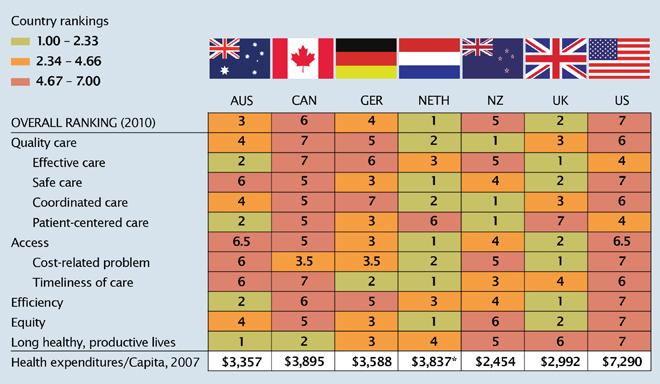 In 2010, the Commonwealth Fund, which is a charitable foundation that has been conducting comparative studies of healthcare systems for quite some time and is not a promoter of private health care, brought together data from advanced industrial countries from 2007 to 2009 and ranked Canada 6th out of 7 (see Figure 1). If you exclude the U.S. and concentrate only on the countries with largely public health systems, we are at the bottom. Source: Calculated by The Commonwealth Fund based on 2007 International Health Survey; 2008 International Health Policy Survey of Sicker Adults; 2009 International Health Policy Survey of Primary Care Physicians; Commonwealth Fund Commission on a High Performance Health System; National Scorecard; and Organization for Economic Cooperation and Development, OECD Health Data, 2009 (Paris; OECD, Nov. 2009). Note: *Estimate. Expenditures shown in $US PPP (purchasing power parity). An Economist Intelligence Unit survey in 2010, called the “quality of death index,” ranked countries according to their ability to provide good end-of-life care. Canada stood 9th out of 40. A study from the Royal Society of Medicine in the U.K. analyzed mortality rates against healthcare spending and we ranked 11th out of 19 countries. A Gallup World Poll in 2010 found that 70% of Canadians were satisfied with their healthcare system, which is a very good rate of satisfaction, except that it lagged behind all the large European countries, Australia and New Zealand. The Euro-Canada Health Consumer Index, a joint project from Sweden and the Frontier Centre for Public Policy, which is admittedly a market-oriented think tank, compared 32 measurements of health care and we ranked 33rd out of 34. The Organisation for Economic Cooperation and Development (OECD), gold standard of the number crunchers, ranked Canada, in its 2010 survey, 25th out of 34 (in 2009 we were 23rd out of 32.) We stood very far behind The Netherlands, which ranked 1st, Germany in 2nd, Sweden in 9th and Britain in 17th place. Those are other countries that use the single-payer system. If you dig down into it and look at individual criteria used in the OECD benchmark, we were 9th in terms of life expectancy at birth, 21st in perinatal deaths, 24th for infant mortality, and so on. After going through about a dozen of these international surveys, I was perplexed. So I sent an email to a very well-known health policy observer in our country, and I said I must have missed something. Can you send an S.O.S. out to all of your folks who are the defenders of the existing system and have them come back to me with the surveys that show the Canadian system in a better light? I am still waiting, and this is not an attempt to make a political point. I really do want someone to tell me where I might find surveys that tell a different story. There have to be some. Unfortunately, my friend and her friends could not provide one. Based on what I have been able to find, then, Canada’s health system stands among the most expensive systems in the world. Healthcare spending as a percentage of GNP is higher in Canada than in Switzerland, France, Germany and The Netherlands. But there is a considerable gap between the cost of the system — the percentage of our economic effort that goes into it — and the results we obtain. We are spending at Cadillac levels, while our system performs like a Chevrolet. It runs and will get you where you are going. But you should not pay a Cadillac price for a Chevrolet. We have had a lot of discussion about sustainability. In his Commission report, Mr. Romanow defined sustainability as “ensuring that sufficient resources are available over the long term to provide timely access to quality services that address Canadians’ evolving health needs.” There are a lot of elastic phrases in that definition: What quantity of resources is sufficient? How long is long term? Who defines timely access? What will Canada’s evolving health needs be? But the biggest shortfall in this definition of sustainability is that it does not consider the impact that healthcare spending has on governments’ ability to carry out all the other functions we expect from them. To isolate health care from other responsibilities reflects what I would call healthcare myopia. The people in this room are interested in health care. People in the education sector or the justice system are all focused on education or justice, and do not put education or justice in the context of competing priorities. Each operates as a silo. But if you are sitting around a cabinet table, you have to face trade-offs. Around the table are the Minister of Health, the Minister of Social Services, the Minister of Transport, and so on. So to just look at health care or education misstates the reality of what governments have to do and misrepresents the sustainability challenge. Canada’s richest province, Alberta, produced a nice chart with its 2010 budget that illustrates the bigger sustainability challenge. It shows that in 1993, Alberta spent about the same amount on health care ($4.2 billion) as it did on education ($4 billion). In 2013, spending on health care will be $16 billion and spending on education $9 billion. The province will have quadrupled spending on health care, and doubled it on education. Presented a different way, in 1993, Alberta spent 26% of its total budget on health care, 26% on education and 11% on social services, leaving 33% for all other priorities. In 2013, Alberta will spend 43% on health care, 23% on education and 10% on social services, leaving just 24% for all other activities of government. That is the trend over 20 years in the province of Alberta. Because Alberta is wealthy, with one third of its budget coming from non-renewable resources revenues, all of those services can get more money. But the trend line is clear: health care gets more, and everything else gets correspondingly less. Québec has the highest tax rates in the country and the highest per capita indebtedness in the country. It has much less fiscal room than Alberta. Québec is lucky in two ways. First, it receives $8 billion in equalization payments a year from the federal government. Second, the fact that doctors and nurses and other professionals in Québec are mostly francophone means they prefer to live and work in Québec and are not as mobile as the doctors and nurses in Saskatchewan or Nova Scotia, who could find work anywhere in North America and work and live in English. This means the Québec government can pay its healthcare professionals less than their colleagues elsewhere in Canada. Claude Castonguay, in his last commission, proposed that the Québec government be more transparent and the government now publishes health accounts, the “comptes de santé” that enable us to clearly see the healthcare system’s financial situation. In the next three years, healthcare spending will go up by $3.5 billion. But overall spending is only going up by $2.7 billion (and education is also going up, by $1.2 billion). How is that possible? First, government had the courage to add a healthcare tax, tied to income, which will raise $950 million and cover half the shortfall. The other half will come from cuts to the budgets of other departments: natural resources, justice, transport, sustainable development, municipal affairs. No minister of finance in Québec or any other province is going to present a budget saying we have cut spending in these eight departments in order to make room for health care. But that is what happens. In Ontario’s last budget, health care was going up 5%, while overall government spending was going up 1.7%. The following departments all lost money: research and innovation, northern development, health promotion, sport, energy, labour, environment and natural resources. The government is now saying it will reduce the increase for the next three years to 3%. In Nova Scotia, the healthcare budget went up by $212 million last year, while the total budget of the province went down. All other departments were cut. In Manitoba, the healthcare budget jumped by $234 million but total operating spending was down $208 million. The budgets of all other departments were cut to fill the $400-million hole. In Saskatchewan, the overall budget dropped $120 million, but the healthcare budget went up $200 million, giving it a $300-million hole to fill by reducing spending in the following ministries: agriculture, primary and secondary education, justice, Indian affairs, highways, environment and tourism. British Columbia increased its budget by $820 million for health, $78 million for education and $55 million for transportation. However, this meant cutting the following budgets: forests, environment, aboriginal relations, agriculture, citizen services, housing and social development, public safety, children and family development and advanced education. And the cash grab does not stop at tax revenues. In B.C., most of the money raised from lotteries now goes into health care. When the Ontario government introduced lotteries many years ago, all the proceeds were to go into culture and recreation to sponsor theatres and athletic activities for young people. Today, 85% of the money raised through gambling and lotteries in Ontario goes to health care, with only 15% left to fund all those other areas that were supposed to receive it. Governments everywhere are scraping every barrel they can find and putting the money into health care. Centre left or centre right, relatively rich or poor, every provincial government is hunting for healthcare dollars. When you ask people how to handle a sustainability problem in any area, the first answer is always eliminate waste and duplication and, once that is done, improve the efficiency of your government. Those are the responses we see in public opinion surveys about the sustainability challenge in health care. My view is that efficiency is absolutely and urgently necessary but that it is not sufficient to deal with the challenges we have in health care. All the commissions that have come out in the last 10 to 15 years — Castonguay, Clair, Romanow, Kirby, etc. — proposed actions to improve efficiency that had three main objectives: satisfaction of patients, improved quality and reduction in the increased costs of health care. But these efficiency gains have yet to materialize in a way that succeeds in turning the cost curve. A number of efficiencies have been introduced: we have more family clinics than we had 10 years ago; we have instituted regional health authorities everywhere (though they are hardly stable); we have merged hospitals and introduced more nurse practitioners. Some feel that the benefits will become apparent once these efficiency measures are better installed in our system, that it is too early to judge the impact of these reforms. Maybe. Large public systems, including health care, are much easier to change on paper than in reality. The efficiency gains that appear so obviously achievable seldom arise in full because of the nature of public sector systems and the limited kinds of efficiency that can be wrung from them. We keep hearing in reports, and from political actors, that we need a patient-centred healthcare system. It has become a cliché. And the fact that everybody says we need a patient-centred system suggests to me that we do not have one. We have a public healthcare system and it is not patient-centred. Taxpayers and citizens wear different hats. The taxpayer pays out taxes that enable government services, notably health care, education and the judiciary, which, in that order, take up 80% of every provincial budget. Then the citizen presents as a patient, student or litigant/appellant to these different systems. It has become a yearly ritual for Beverley McLachlin, Chief Justice of Canada, to give a speech in which she deplores the fact that the legal system is too costly and too slow. How could a system in which the public pays the judges, court staff, and administration of the courts be too costly and too slow? That is not what the litigants and appellants want. They want a system where justice is dispensed rather swiftly, because a lengthy process becomes very expensive. Somebody is running the system and it is not the litigant or the appellant but, in all likelihood, the judges and the lawyers. If you had a university that was really student-centred, would you have classes of 400 to 800 students? That business model would be thrown out tomorrow. The universities are not based on a student-centred model, but on the preferences, promotion and tenure of the professors who run the universities. No student would present to a university and say I want to be in a class of 700. Students want to meet professors, not 22-year-old teaching assistants. But the universities are not set up that way. They are set up so that the professors can do their research, which is a central priority because tenure and promotions are based principally on your research and publications, not on how much you teach. It would be difficult to say we had a student-centred university system. Health care is no different. All the calls for a patient-centred system emphasize the fact that we do not have one. It is not that doctors do not care about their patients, or university professors do not care about their students, or judges do not care about the people who present in their courts. They do. But the incentives in the system and the way the systems are organized are not patient/student/litigant-centred. A lot of the proposals for efficiency assume that the system can be changed by focusing on the patient. But in fact these systems, and I have gone outside health care for a reason, are not centred on the citizen as user of public services. The complexity of these public service systems is not recognized in some of the solutions proposed. The McGill University Health Centre is in itself a very complicated institution. But it is just one part of a system that is even more complicated. I like to think of the healthcare system, like the education system, as a big jigsaw puzzle. Any one piece touches three, four, sometime five other pieces. It is difficult to assess the impact that moving one piece will have on all those adjoining pieces. In all civil societies, there is an ongoing debate about the appropriate balance between equity and efficiency. When everybody is equal, there is no efficiency. And if all the emphasis is on efficiency, then equity goes out the window and a lot of people get left behind. So we keep trying to find the right balance between them. But in health care, because from the beginning we put all the emphasis on equity, we have a different debate than we do in the rest of society. We have excluded the trade-off between equity and efficiency and said that the pillar of the system should be equity. Yes, we should try to find efficiency, but not the way we find it in the rest of society through the market, but through top-down administrative regulations and dictates. We have put ourselves in a bit of a straightjacket in terms of trying to find efficiency gains in a system that excludes the dynamics we use outside the system to find the right balance between equity and efficiency. So the debate we are having is not about whether efficiency gains are necessary, but between those who believe we can bring these about by continuing with the prevailing “rational planner” model and those who want to use the model that is employed in other parts of society: the market. Our healthcare system is also plagued by a double moral hazard. If patients do not have to pay for the care they receive and doctors do not have to pay for the treatment they recommend, there is no incentive to keep costs down. Not that people are rushing to go to the hospital unnecessarily or that doctors insist on the most expensive therapies, but there are no incentives to contain costs at an individual level. In the rational planner model, government has to keep pushing down on the system and struggling to keep costs down. One of the main challenges today is to de-hospitalize the healthcare system. It has been built around hospitals and does not have enough facilities for folks who should be elsewhere. The payment system needs to correct the incentives and bring them in line with an efficient system. Federal-provincial relations need to change so that accountability is better defined. Right now nobody knows who is responsible for what and responsibility is tossed around from one level to another. Ottawa provides about 25% of healthcare funding; the provinces pay for services, but have delegated some aspects to regional authorities. If I want to complain or get accountability, do I turn to my hospital, to my regional health authority, to my family clinic, to my provincial government? There is an enormous jumble of responsibility. In terms of public opinion, we are nowhere. Public opinion changes in stages. First, the public has to believe that something exists. They do know the healthcare system exists. Second, they have to be persuaded that there is a problem with whatever exists. The Canadian public is not fully persuaded of that yet and this is what is preventing us from moving to the third stage, where groups or political parties suggest different solutions. Politicians will step up to propose solutions to a recognized problem, but they will not spend political capital emphasizing that there is a problem. It is up to civil society to point out to our fellow citizens that we face problems with the financing of the healthcare system and to begin discussing some of the choices that will become inevitable fairly soon. Do you want to pay additional taxes? Do you want to see some services cut? Do you want to see private money injected into the system? These are real choices that other countries have made. The Canadian public needs to be informed of the facts and prompted to think about the possibilities. The actors in civil society, be they universities, think tanks, media or other organizations, need to increase awareness and educate Canadians about the situation in which we now find ourselves. Conferences like this one and many others will enable us to better inform our fellow citizens of some of the choices in front of us, because on this issue, our political leaders will be followers. 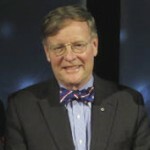 Jeffrey Simpson joined The Globe and Mail in 1974. He has won the Governor-General’s Award for nonfiction, the National Magazine Award for political writing, the National Newspaper Award for column writing and the Hyman Solomon Award for excellence in public policy journalism. In 2000, he became an Officer of the Order of Canada. Mr. Simpson has published eight books and numerous magazine articles, spoken at major conferences in Canada and abroad, been a regular contributor to English- and French-language television, and been a guest lecturer at Canadian, U.S. and U.K. universities. Mr. Simpson has been an Adjunct Professor at the Queen’s Institute of Policy Studies and The University of Ottawa Law School, and is now Senior Fellow at the University of Ottawa’s Graduate School of Public and International Affairs.